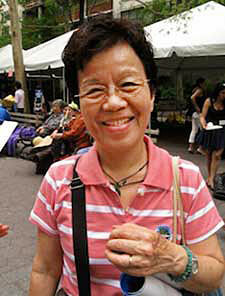 Junko is Chair of the Association of Hibakusha-Brasil Pele Paz. In 2008 both she and Mr. Morita traveled on Peace Boat to talk about their experiences in many countries. In Vietnam, For example, Mr. Morita and Ms. Watanabe interacted with the second and third generation of victims of Agent Orange. “I was born in Hiroshima and later I married a Japanese man and went to live in Brazil. I went to Brazil at the age of 25. I returned to Japan when I was 38 years old. And at that point in time, for the first time, I understood that I was a survivor of Hiroshima and Nagasaki. “I was born in downtown Hiroshima, but during the Second World War our family had been evacuated from Hiroshima, and since I only was two years old I can’t remember; though when my parents told me that I was a survivor, I was really shocked. “On August 6, 1945, at 8:15, my mom was at home with my younger brother. My elder brother and I were playing in the yard of a temple near my home. Then, my mother felt a strong wind, a terrible wind, and she saw burnt papers falling in front of our home. My mom was surprised and she came to get us at the temple. At that moment the black rain began. The rain was black and sticky. “Before the bomb was launched that August 6, the weather was nice in the morning, and they say that the atomic bomb exploded 580 meters above the earth. Then, since it exploded high above, it does more damage with its hot rays and hot wind, which burn people. After the bomb exploded, all the dust and papers flew upwards and then came the black rain with radiation. “After being exposed to the black rain my body had this condition. I suffered from diarrhea every day. I could eat, but no nutrients remain in my body, they all were lost, everything that I ate. My parents thought their daughter would die. In fact I was only two years old, and I cannot recall any disastrous scenes. When I turned 60, I joined an association in Brazil. At present, 132 survivors of Hiroshima and Nagasaki are living in Brazil. “At present the average age of these survivors is 75, they are getting old. That is why the president of the Association in Brazil asked me to help the association because I am a young survivor. “Although I am a survivor, because I could not remember anything, I did not know anything about the atomic bomb before I joined the association. “Later I had the opportunity to read all the documents written by 200 survivors of Hiroshima and Nagasaki, who lived in Brazil. They wrote about what happened in Hiroshima and Nagasaki. That was the first time I knew about the reality of the atomic bomb in Hiroshima. They described the very brutal scene. Sadness and resentment made me feel very unhappy and I felt that I was shaking. “I also found a documentary with images, filmed by a Japanese journalist. However, after the atomic bomb, US academicians stole this information and took it to their country. They were never going to show us this video I found in the office. It has been somewhat difficult to watch it because is an old tape. So, I asked a friend to turn it into a DVD. We and 10 survivors, friends of ours, saw the film. The scenes in the documentary are too brutal and I watch it with much sadness; the city of Hiroshima was disappearing. “We saw that in the documentary, we saw how the buildings were all burnt and the city was completely black. There were also the people, who seemed to walk unconsciously; skin hanging from their arms because it had deteriorated; their eyes falling out of their sockets. People walked, but unconsciously. When I saw that documentary, although I could not recall that event, I understood I was there at that moment and I also understood that such a thing was done by human beings; then I felt strong resentment and sadness. “Then I came up with this idea. We have to tell those testimonies to other generations, and two years ago, in 2008, I participated in the Hibakusha Project undertaken by the Peace Boat Organization. With 100 survivors on board, we travelled and gave our testimonies in every port; I also met other Hibakushas around the world. “In Vietnam, we met the victims of Agent Orange, from the Vietnam war, we learned about what they and their parents had gone through. The effect on their bodies is transmitted from generation to generation. My older brother, who was playing at the temple, died two years ago at the age of 67. After being submitted to the black rain, as I was, he had weak bones and became very weak. He died from liver cancer. Now that I see the survivors dying, I am very concerned about my health. “I would also like to tell you about the story of Origami, the crane figures made from paper. They represent a symbol of peace for us and now for the world. They accompany the story of a young girl, named Sadako Sasaki, who died from leukemia at the age of 12. This year, when I attended the Non-Proliferation of Nuclear Weapons Conference held in New York in May, I had the opportunity to meet Sadako Sasaki’s brother. Like me, Sadako was hit by the black rain. She grew up healthy until she turned 10. Then, she became ill and was hospitalized; she was never able to leave hospital. “We are now in the same situation of Sadako Sasaki. We were hit by the black rain at the early age of two. She is dead and I still survive. Therefore, I feel this great responsibility of explaining what the atomic bomb is and who the survivors are. Survivors have to live with many physical problems and mental preoccupations until they die, and we had to tell this to other generations. “We learned that there are different kinds of hibakushas around the world, in several places. For instance, the indigenous people who extracted uranium from the mines are very affected by the radiation; the people who live near nuclear plants too, and we have to learn these things to educate people.